The Customer Files feature allows you to upload and associate files with your customers. You can also enable the option for your customers to have the ability to upload files. Don&apos;t feel like reading? This 20-minute video walk-through will show you everything. 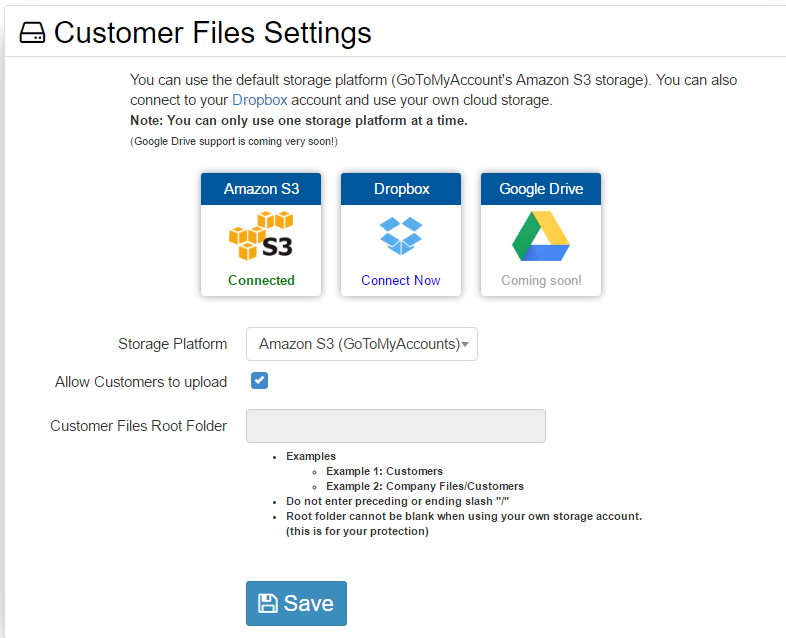 The default storage platform is the GoToMyAccounts Amazon S3 storage bucket. Your files are protected inside your own folder. This will be turned on by default when your portal account is created. You can also connect to other cloud storage platforms like Dropbox and Google Drive. 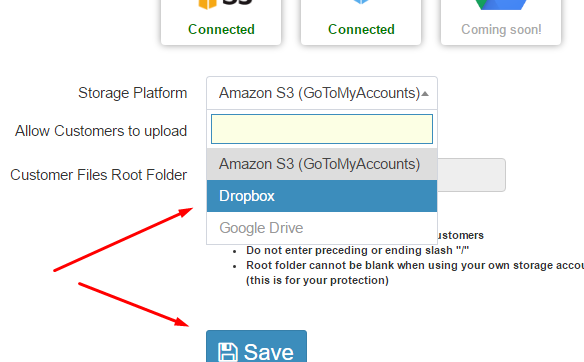 When using the GoToMyAccounts Amazon S3 storage, you won&apos;t need to do anything except decide if you wish to allow customers to upload files. The default for that options is false. 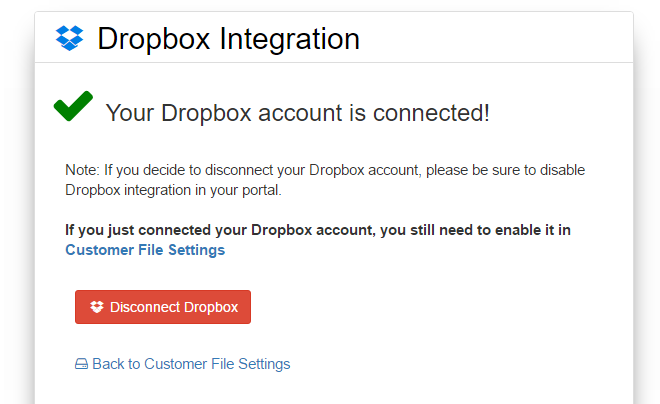 If you wish to connect your Dropbox account, you need to first connect (authorize) your Dropbox account. Just click the "Connect Now" box and then click "Connect Dropbox" on the next screen. When you see the Dropbox authorization screen, click "allow". And that&apos;s it! Your account is now connected. You still need to go back to the Customer Files settings page and enabled Dropbox as your storage platform. 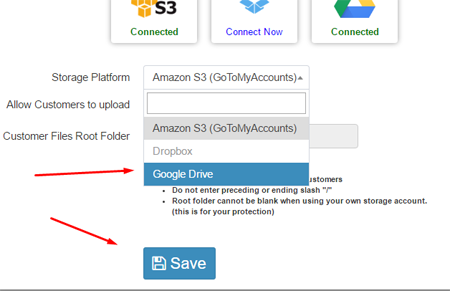 Select Dropbox, then click "save"
If you wish to connect your Google Drive account, you need to first connect (authorize) your Google account. 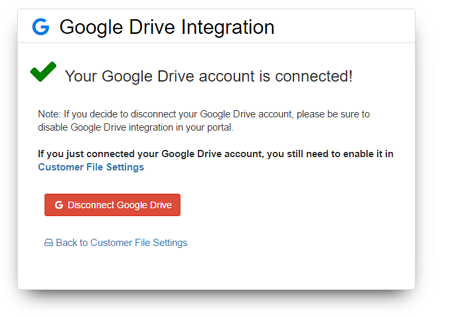 Just click the "Connect Now" box and then click "Connect Google Drive" on the next screen. 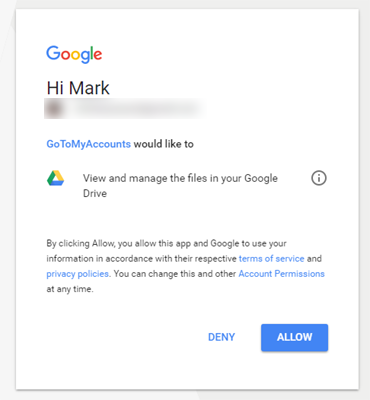 When you see the Google authorization screen, click "allow". Select Google Drive, then click "save"
If you want to allow customers to upload files, click the checkbox to enable and then click "save". This option is only available if you are using your own storage account. This is the root folder where all your customer folders/files will reside. 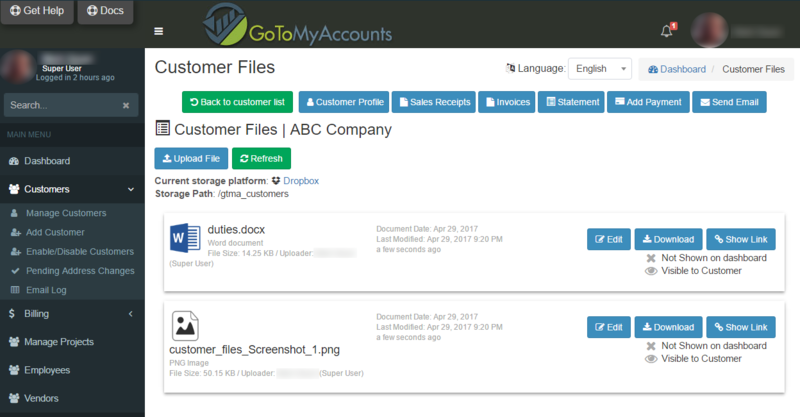 The default folder is "gtma_customers" and will be created automatically once you begin using the Customer Files feature. if you decide to change this folder, it does NOT rename the existing folder. It will simply create a new one. So you may need to manually move existing files to the new folder. What happens if I add/delete/modify files directly in my storage platform? You can do that and GoToMyAccounts will handle that just fine. It is still recommended that you manage the file deletion inside the portal so it does not leave an orphaned meta record in our database. What is the Show on Customer Dashboard option for? You can force files to display on the dashboard page which is what your customers will usually see first. This is useful for important files they might access often, or files you want them to more easily see. How are the File Notes, Doc Date, and other metadata stored? Although we pull and list files directly from the storage platform, you have the option to utilize notes, document date, and a few other metadata elements. These are created and stored either when the file is created (in the portal) or when it is first updated in the portal. Files created directly in the storage platform will receive default metadata for file creation time, size, etc. By default, those files ARE visible to customers unless you go in and tag them as not visible to customers. 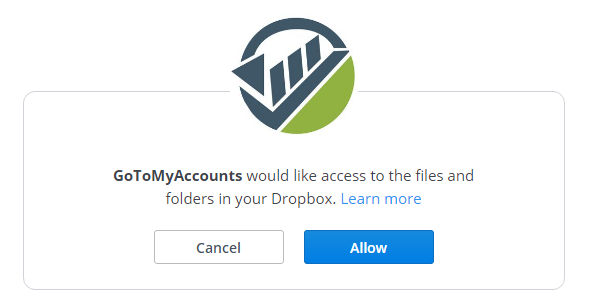 For example, if you are using Dropbox for your storage platform and you copy a PDF file into one of your customer&apos;s folders, they will have access to that file immediately by default. Will files in sub-folders show in the portal? No. Currently, the files will be pulled from the root of a customer&apos;s folder and it will not be recursive. Only files in the immediate root of the folder will be accessible. How are customer folders named? Customer folders need to remain constant so that the portal always knows where to read and write. The first time a customer&apos;s files are read or accessed, the customer folder will be created automatically and then saved (and will not change) from that point forward. The folder name will be a "file-safe" variant of the customer&apos;s Display Name in the portal. This is so you can easily identify customer folders when browsing the folders within your storage platform (such as Dropbox or Google Drive). So can I just upload a file to my customer&apos;s folder right inside my cloud storage platform? Yup! As mentioned in a previous section, as long as the folder for your customer has been created by the portal, you can begin dropping files right inside the folder and your customer can access them. if you need to restrict access to any file, add notes, etc, you can do that from the Customer Files screen. Where are my customer&apos;s files managed? 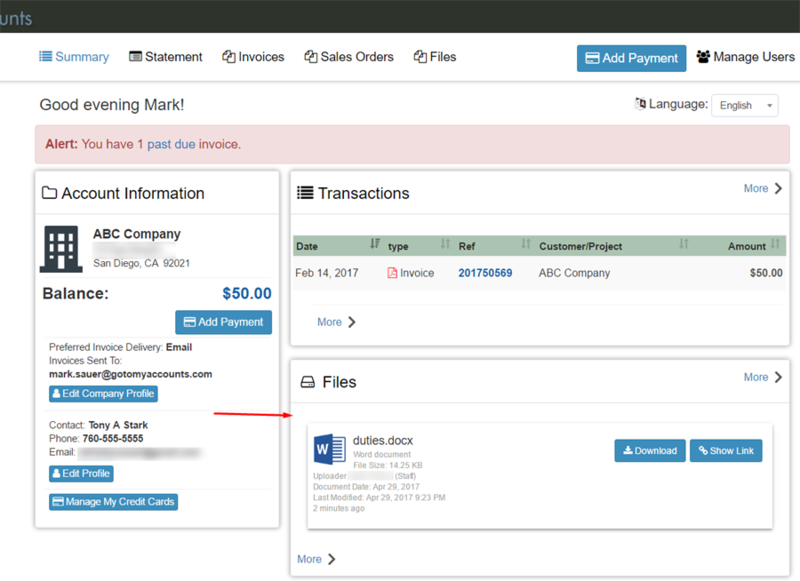 To manage a customer&apos;s files, just log in to your portal and when pulling up a customer record, click the "Files" button. Where can my customer see and download their files? When your customer logs into the portal, they can see their files by clicking on the Files menu (top of the page). Optionally, you may flag some files for being shown on the dashboard. Those files will be listed right below the Recent Transactions list.